PRE are Nottingham Catering Engineers, a long-established, experienced local company specialising in providing unique and bespoke commercial kitchen design, installation and maintenance/repair of catering equipment, ventilation and supplies throughout Nottingham, Derby, Lincoln and Leicestershire and the Midlands....but we offer much, much more. We are specialists in the design, provision and installation of commercial catering equipment throughout Nottinghamshire, Derbyshire, Lincolnshire, Leicestershire and the surrounding areas of the East Midlands along with being able to repair older catering equipment that has served you well and you'd rather not replace - we can source parts and spares for 99.9% of appliances for your catering kitchen repair. With a wealth of knowledge as a kitchen equipment supplier and in the catering industry, our catering equipment installers offer a comprehensive range of services, including the supply and installation of commercial cooking equipment, made to measure canopies, stainless steel tables, work units and refrigeration systems amongst many others. PRE are also able to now offer our own designed and manufactured recirculatory equipment. Saving over 50% on the cost of other manufacturers units PLUS reduced maintenance. As Nottingham's longest established and experienced catering engineer company we are always responsive to how best enable our customers to keep on top of their catering equipment maintenance requirements - along with the normal hectic day-to-day responsibility of running a busy catering business. ​To that end, as an established catering equipment supplier we have recently introduced our Service Packages which simplify the process and offer great value - Simple! Our long and varied experience of designing and installing ventilation and extraction systems ensures PRE can handle any catering requirement to ensure a clean and pleasant working environment. We are able to design and supply your exact requirements to the very latest (and upcoming) regulations. We have an in-house manufacturing facility which is unique and staffed by fully trained and experienced craftsmen. We work with all the major catering equipment suppliers to be able to provide a complete, modern and efficient catering environment designed for your exact requirements. Premier Restaurant Engineering supply and maintain Blue Seal, Lincat, Falcon, Parry, Rational amongst other top brands. Our preventative maintenance advice & procedures mean less inconvenience for your business. Great Value service packages available too! As experienced catering equipment installers we understand the importance of reliability and functionality in a demanding environment, designing and installing catering equipment that meets the specific needs of each of our clients on an individual basis. Our made-to-measure stainless steel cooker hoods and extractor units are custom built for integration with new or existing cooking equipment configurations, designed to provide maximum performance in a commercial kitchen. At PRE (Premier Restaurant Engineering Ltd), our team of commercial kitchen catering equipment installers strive to provide an excellent service to all customers. We liaise closely with each of our clients, keeping them informed at all stages of the project from the planning and designing, to the installation and maintenance of all commercial cooking and catering kitchen equipment. Our size and experience ensure that we are able to provide catering kitchen maintenance Lincoln at a convenient time to suit you and the smooth running of your business. From one simple call we can manage your restaurant installation Derby and take away all the project management of it leaving you free to run your company. If you are considering who to use for your commercial catering installation Leicester then give us a call to discuss your requirements. Any commercial catering engineers Nottingham requirements can be easily scheduled and completed with the minimum of disturbance to you or your customers. Each of our catering equipment installers are highly qualified and hold gas safe certification, ensuring all catering equipment is installed to the strictest of standards, in full alignment with legislative requirements. 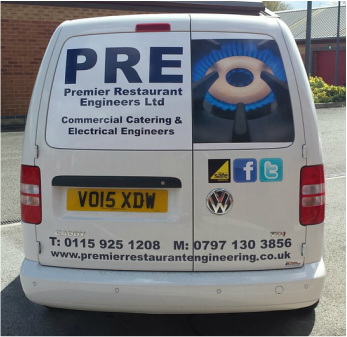 For more information on our range of commercial catering equipment or for free, friendly advice from our catering equipment installers call PRE (Premier Restaurant Engineering Ltd) on 01159 251 208 or visit our Contact Us page. To achieve a planned aim of preventing catering equipment breakdowns, general kitchen inconvenience and disruption we would always recommend a Planned Preventative Maintenance scheme which would go a long way towards your catering kitchen maintenance Lincoln along with lengthening the working life of your equipment, maintain efficiency and most importantly keep everybody safe. Call us at PRE for any help or advice on the above at any time. PRE are able to provide cover and total catering kitchen maintenance services Derby for your entire commercial kitchen maintenance needs. ​​​We offer restaurants, pubs and hotels a complete suite of services helping you to provide the highest operational standards and thus keep unexpected and costly downtime to the absolute minimum. If you are planning to add additional appliance/s, improving the layout or even installing a completely commercial kitchen installation Nottingham facility let PRE advise you of the latest best-practice, designs and regulations to ensure you get the maximum return for your purchase. We are always delighted to share our experience and knowledge on ventilation / extract rates, interlocks, pipe sizing etc along with LPG, Natural Gas, electric. All our installations are fully guaranteed and certification issued. When considering a new commercial catering installation Leicester it is imperative to ensure you receive current regulatory-compliant advice along with guidance on current best-practice on layouts, equipment, different fuel types etc. This will ensure you maximise the equipment now and preserves the value of your ongoing investment. ​PRE will install all types of equipment built by all catering equipment manufacturers, subject to a site survey.